Bullet trains – it’s a technological marvel in its own right and we’re soon going to get one. But is that the need of the hour when we, as a nation, are struggling to create basic infrastructure like sustainable roadways? Not exactly. Let’s face it, roads alone can paint a clear picture of the advancements a nation has made over the years, and currently, India’s canvas isn’t attracting a lot of eyeballs for all the good reasons. Now, there are two ways to deal with the pathetic road conditions in India – we either bring an end to the rampant corruption that’s hampering our progress or buy a set of wheels that can help us cope with bad roads. No prizes for guessing what option we Indians are warming up to – SUVs and on/off-road motorcycles are getting ever so popular in India, and their ability to tackle the worst our roads have to offer make them the ideal choice of weapon. A classic example being the Triumph Tiger. This is the Explorer XCx, the biggest and the most feature-rich Tiger 1200 that you can buy in India, yet. In its latest avatar, the Explorer may resemble its predecessor but Triumph tells us it’s an all-new motorcycle underneath. Right from hardware to software and even the aesthetics, everything has undergone a complete overhaul and the Explorer now comes across as a more rider-friendly motorcycle than before. Take, for instance, the modern chassis; there’s a new, lighter frame along with which Triumph has also thrown in the best-in-the-business semi-active WP suspension. What it has done to the Explorer, apart from getting it on par with its key rival, the Ducati Multistrada 1200 Enduro on paper is, it’s added a new level of agility and comfort both on- and off-the-road. At close to 280 kilos with all fluids intact, with more than 835mm of seat height and a newly-designed massive windscreen, the XCx is a mammoth of a motorcycle and would be a bit of a handfull for shorter riders. But with all the modern tech and gadgetry, the it feels much lighter and easier on its feet once on the move. Sure, the newly added ride-by-wire system makes all the power from the updated 1215cc triple available right from the word go, however, the 137 horses do not need much provocation and you will certainly need a firm grip on the bars as the instant acceleration in the sportiest mode can definitely catch you off guard. Talking of modes, the Explorer XCx gets three of them; Road, Rain and Off-road. And as self-explanatory as they are, these three should take good care of the bike’s power, ABS and traction control needs as per your mood. For most part of our ride in and around a sodden Mumbai, ‘Rain’ proved to be the best-suited mode where around 36 horses hit slumber, and that is more than enough to tackle urban conditions. And despite being a humongous motorcycle, ambling around town, doing 45kph in 6th doesn’t bother it much. What does, however is the stop/go traffic that makes the motor lose its cool and throw a few tantrums. You can’t really hold that against it as the Tiger, more so the Explorer, was born to be an adventurous bloke rather than a city slicker, and that it does to near perfection. The motor that impresses with its tractability, also has a penchant for high revs and munching long miles. And complementing it well is the semi-active suspension set-up that does a brilliant job in ironing out the blemishes and offering a ride that won’t leave you with a sore backside. The WPs adjust on their own, depending on the modes and conditions you’re subjecting them to and when you throw in a seat that is a motorcycle equivalent of an office couch, life on the road or out in the wild couldn’t get any better. Add to it the confidence offered by the new-for-Tiger cornering ABS and traction control, just like the Enduro, which means you really need to be a fool to unsettle this one around corners. But what about off-roading, you ask? Well, we spent a day beaching around and riding on Mumbai streets – which is as good as off-roading – and it’s pretty evident that the Tiger does like to get down and dirty. The off-road mode cuts down on power to prevent any excessive wheel spin, but offers enough grunt to pull you out of the toughest of situations. And although we didn’t venture deep into the murkier waters, we’re sure the Explorer would make its way back to the concrete jungle without breaking a sweat. Can’t say the same for the rider, though, as this is a heavy motorcycle and it doesn’t have a lot of tricks to mask its weight at low speeds. Disconnecting the rear ABS in this mode does let you safely pull the tail out, but we weren’t feeling particularly brave to push the Explorer on a squelchy beachside. What we did feel good about is being on the saddle for long hours without an ounce of discomfort, be it in city limits or out on open highways. Even the older Explorer was a comfortable and a likeable motorcycle, but it fell behind its rivals when it came to embracing modern tech; but that’s a problem which has been overcome. And when every element on this Triumph comes together, the riding experience is worth all the intricacies associated with its weight-management at low speeds. Even the huge windscreen, which can now be operated by the flick of an electric switch, does a great job of saving you from all the wind blast, bugs and dust at high speeds. The downside is that you will miss the breeze when you’re simply pottering around and it also blocks your vision at night, especially when it’s pouring. 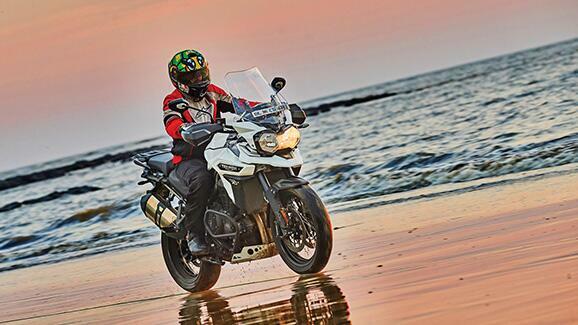 At the end, the new Triumph Tiger Explorer 1200 XCx is a capable, all-terrain motorcycle that takes good care of your touring needs and won’t leave you stranded when the roads disappear. With all the gadgets on-board, it surely is easier to go off-the-road and get back in one piece, and the same goes for your time on twisty mountain roads – the electronics will make every effort possible for you to live and tell the story. And while it may be a few lakh rupees dearer than its rivals, the Explorer XCx comes across as a solid package with new electronics and updated hardware. Liquid-cooled, in-line 3cyl, 1215cc, 137bhp, 123Nm, 6A, fuel tank: 20 litres, 253kg (dry), Price: Rs 18.75 lakh, ex-showroom.